By 1893, it seemed that Oscar Wilde had done everything. Originally celebrated for his work as a poet and lecturer, Wilde became an influential journalist, editor and critic. His sole novel, The Picture of Dorian Gray, shocked Victorian readers and cemented his literary reputation. By the time he started writing An Ideal Husband, Wilde had added the title of successful playwright. His previous two comedies, Lady Windermere’s Fan and A Woman of No Importance, had played to great success in London. Work on An Ideal Husband began in the summer of 1893 in the town of Goring-on-Thames (the character of Lord Goring is named after the place). Wilde claimed to have written the first act “in every detail, as it was ultimately performed” in a single week in September 1893, and he completed the play in London that December. The “ideal husband” is Sir Robert Chiltern, a well-respected politician whose career was built on a single dishonest act. When the devious Mrs. Cheveley blackmails him with that information, he finds both his reputation and his marriage in danger. The dandy Lord Goring makes for a surprising savior. In addition to thwarting the blackmailer, Goring must reconcile Sir Robert and his wife, who can’t love a man who is less than ideal. The play’s opening, on January 3, 1895, at the Theatre Royal, Haymarket, was a triumph. As Wilde’s professional star continued to rise, however, his personal life would lead to his downfall. Wilde was engaged in a passionate affair with a young nobleman, Lord Alfred Douglas. Douglas’ father, the Marquess of Queensberry, furiously disapproved. 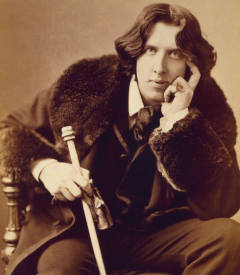 Matters escalated in February 1895, when the Marquess left a calling card at Wilde’s club: “For Oscar Wilde, posing somdomite [sic].” Wilde’s friends urged caution, but high on success and at Douglas’ urging, Wilde instead sued the Marquess for libel. The trial was a disaster, as Queensberry was easily able to expose Wilde’s liaisons with other men. Wilde was charged with “gross indecency.” Like Sir Robert Chiltern, Wilde decided not to back down from a threat. Unlike Sir Robert, Wilde lost. The subsequent trials and prison sentence destroyed his reputation and health. Though the lighter The Importance of Being Earnest has become more famous, An Ideal Husband has matured well over time. George Bernard Shaw greatly preferred it, writing that Wilde “plays with everything: with wit, with philosophy, with drama, with actors and audience, with the whole theater.” Like Shakespeare, Wilde improved where he stole; An Ideal Husband is one of the best Victorian melodramas despite mocking convention (not one but four blackmail attempts!). The play experienced a renaissance in the 1990s, with Sir Peter Hall’s 1992 West End production transferring to Broadway in 1996. This was followed by a well-received feature film adaptation in 1999, starring Rupert Everett and Julianne Moore. This recent boom in popularity shows that, more than a century after it opened, An Ideal Husband remains more relevant than ever. Times may change, but our fascination with the private lives of public figures never flags.